The Performance Monitor software is a PC based real time testing package to use with the SPEEDBOX system. 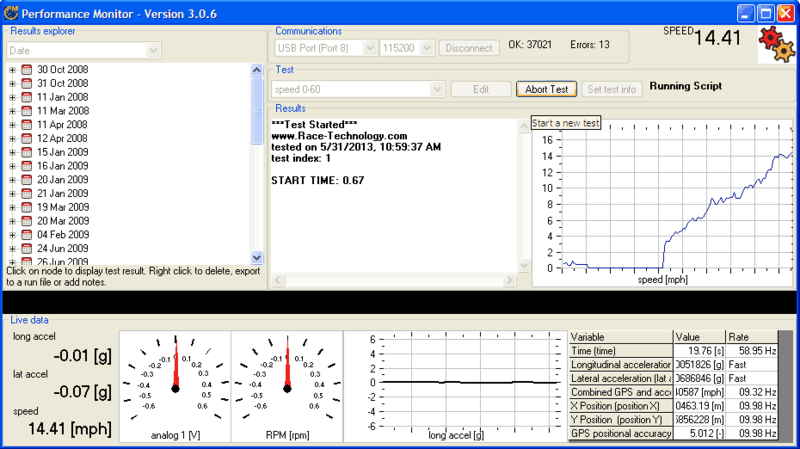 The software is typically used for acceleration and braking type tests. Whilst it is simple and clear to use, it is also exceptionally powerful and can be customized using the "script language" system. The software is simple to operate and doesn't require a highly skilled operator to complete the test work. The driver can simply click the start test button and then follow the on-screen prompts. The SPEEDBOX unit can be connected to a PC using a USB or serial link. Connecting the instrumentation directly to a PC running the Performance Monitor software enables real time tests to be performed and interactive analysis of the data. The software uses a script language so the exact test sequence can be defined "back at base" and whilst doing the test almost any combination of results can be displayed as well as displaying clear prompts for particular actions, for example "accelerate to 60mph","start braking NOW","gently pull away" etc.